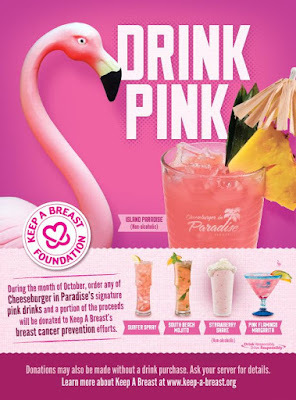 The charity is called the Keep A Breast Foundation and they sure do like cross promotions with alcohol and junk food. There was their "Brewbies" beer festival, their "I love boobies and pizza" partnership, their partnership with Little Black Dress Wines, and my favourite, their "Drink Pink" Cheeseburgers in Paradise partnership that saw a whole 10% of the cost of pink drinks go back to the Foundation. I bet that'd be fifty shiny cents a glass! "Please remember - More than one (1) drink each day (if you are 21, of course) increases your odds of developing breast cancer. Alcohol can increase the levels of some hormones such as estrogen and unusually high levels of estrogen increases the risk of breast cancer. We know it's not fair, but think of the consequences if you drink too much. Be responsible and drink in moderation if you do." But beyond ironic is what's odd. What's odd is the fact that notwithstanding what the Keep A Breast Foundation says about the safety of a drink a day, meta-analyses on alcohol and breast cancer risk identified associations at all levels of consumption. This massive meta-analysis of 53 epidemiological studies, including 58,515 women with breast cancer and 95,067 women without the disease found that for every 10g of alcohol consumed (less than that found in a single drink), relative risk of breast cancer rose by 7% (albeit the absolute risk rise would be quite small). This similarly massive UK study found the rise in relative risk of 10g of alcohol per day to be 11%. And this study looking at the risk of breast cancer recurrence and alcohol consumption found that drinking just 6g a day of alcohol increased recurrence risk. But hey, $0.50 per glass!